Food Truck Safari, plus Wild Nights and Holiday Lights at the Zoo Tonight! The monthly SactoMoFo Folsom Food Truck Safari closes out the year with a great line-up of food trucks, with something for everyone. Bring the family and come on down for great food and entertainment, adult beverages are allowed, but not sold at the event. It runs from 5pm to 8pm the 3rd Wednesday of every month, in the park right next to the Folsom Zoo Sanctuary. You can’t miss it. 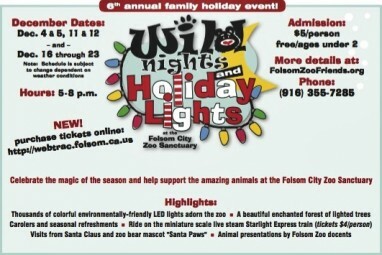 Afterward, take a strong through the Folsom Zoo Sanctuary for the annual Wild Nights and Holiday Lights display. Admission is only $5 per person. Come to the annual Folsom Historic Folsom District this Friday, December 4th, for the annual Christmas Tree Lighting Ceremony and Holiday Celebration. 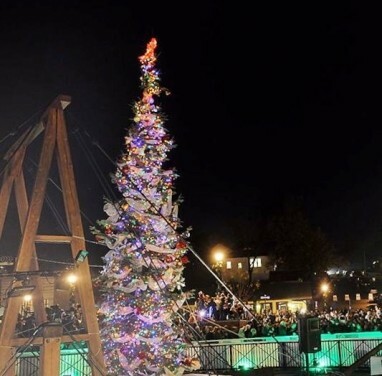 This fun Folsom family event features street vendors, Santa photos, Kids Fun Zone, musical performances, free train rides and more.